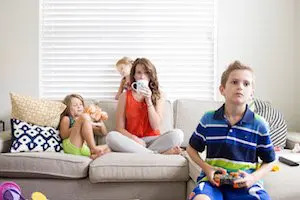 It’s the start of the new year and the excitement of the holidays is behind us. 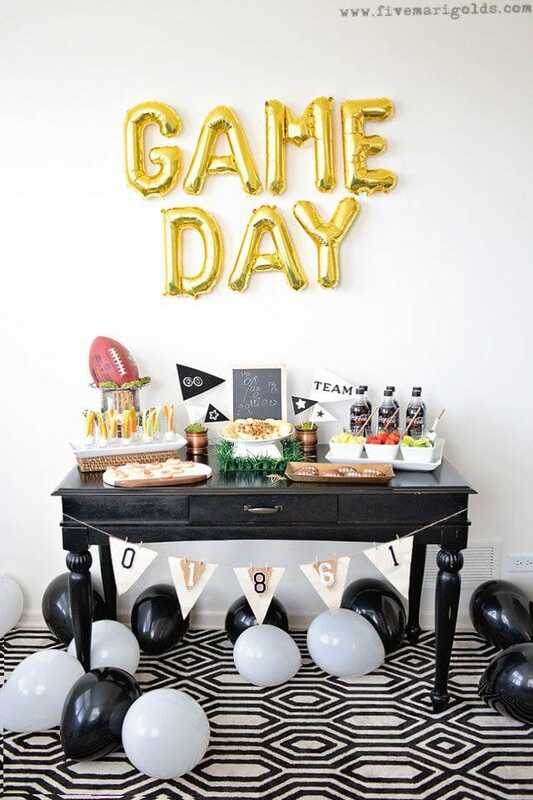 So naturally, this party planning junkie has turned my sights on gearing up for the upcoming big game! This year, I was one of the millions of Americans who made a new year’s resolution to take better care of myself. 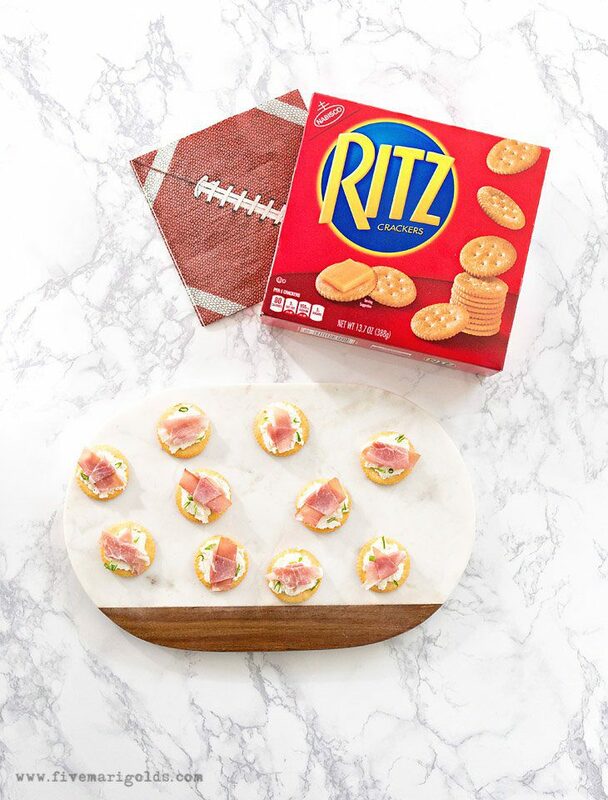 However, eating light and the big game don’t always mix, so this year I’m resolving to throw a game day party that is both delicious and light. After all, the food is one of the best parts of the day, so no skimping on flavor will be tolerated – by my guests OR me! 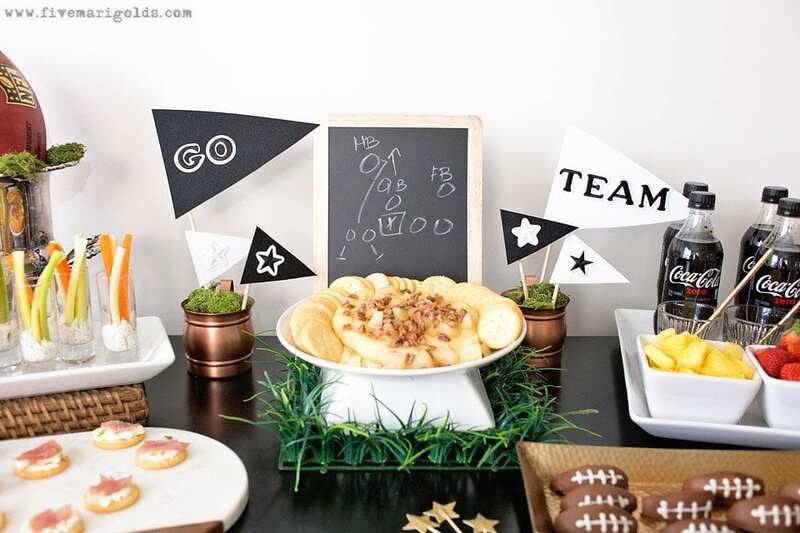 Today I’m going to show you how to throw the ultimate game day watch party – complete with lighter recipes and inexpensive, DIY decor ideas. 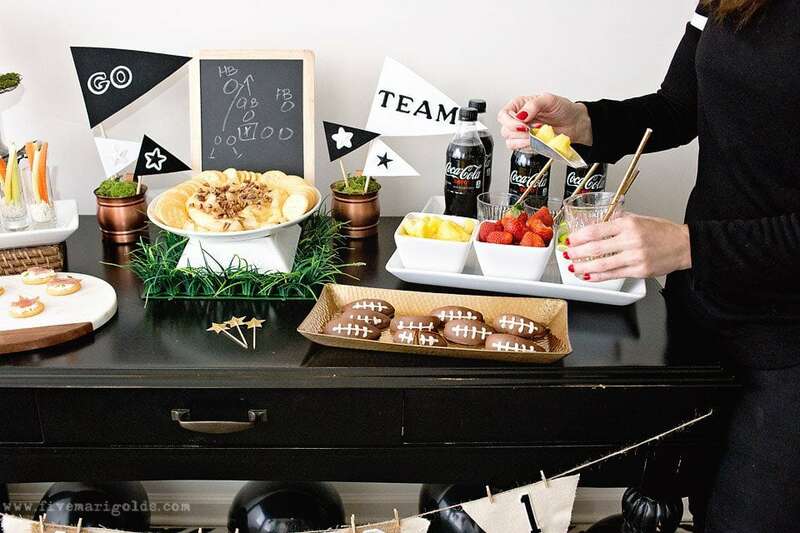 Last weekend, I pulled together a party spread for the football game, in preparation for the big one! 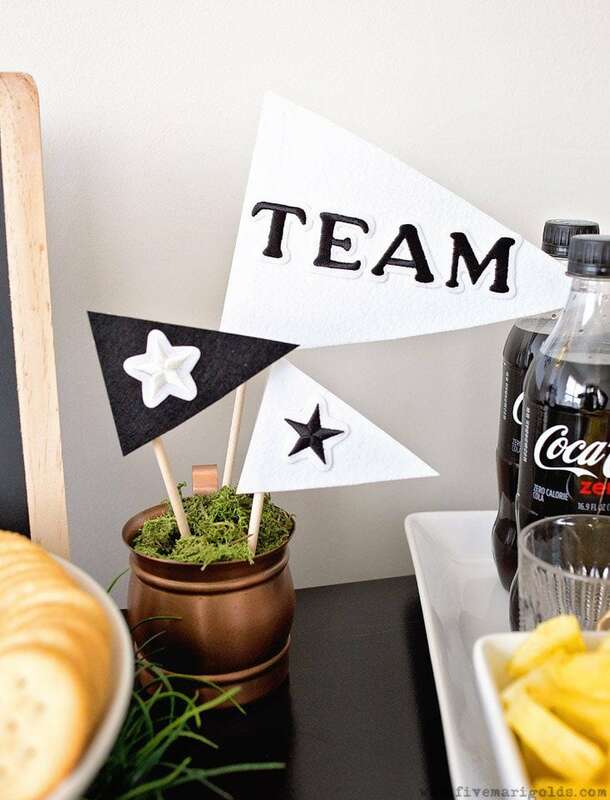 When I have a special gathering with friends and family such as this, it’s fun to set a theme that makes it feel extra special. 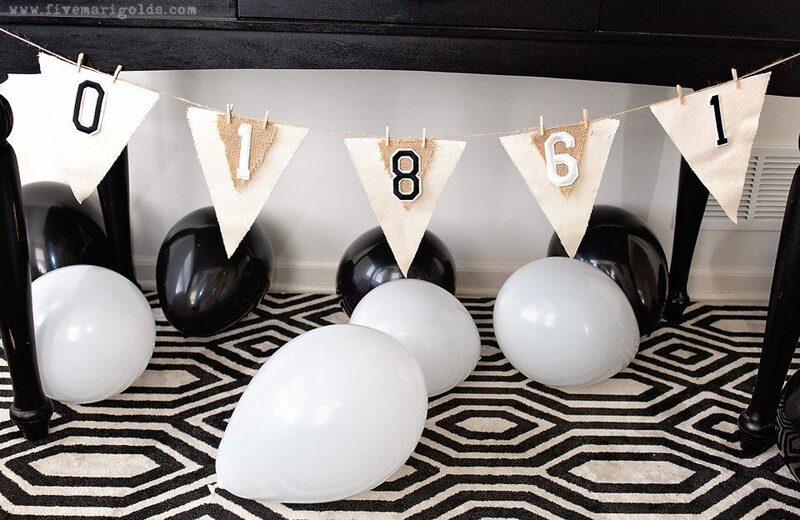 I also believe in simple, DIY party decor that makes a big impact, on a budget. For this occasion, I want something with a vintage varsity feel to it. I’m started with these fun gold foil balloons. 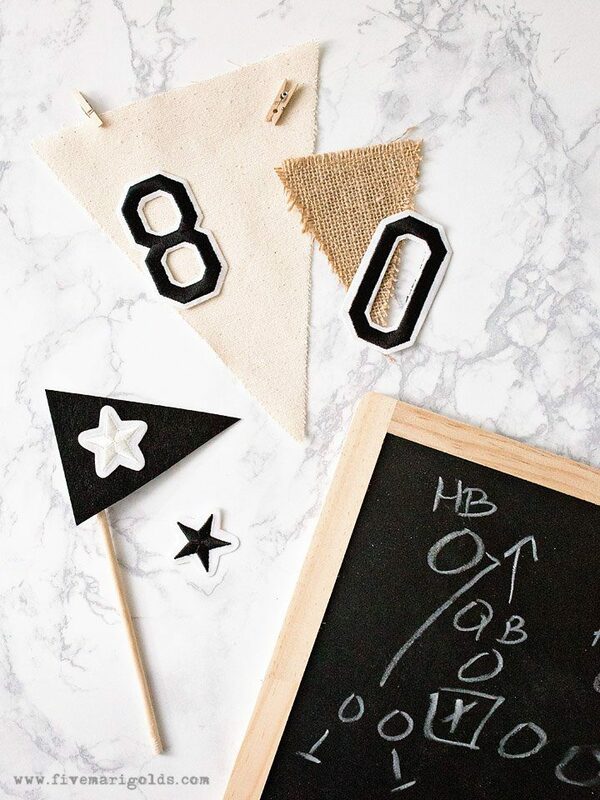 I decided to make flags and pendents for the table using various bits of felt and fabric I had on hand, and added black stick-on varsity letters I got at the craft store. I placed the flags in some copper mugs and topped them sponge moss. To make a simple bunting, I used mini clothes pins from our art wall to attach the pendants to hemp string. 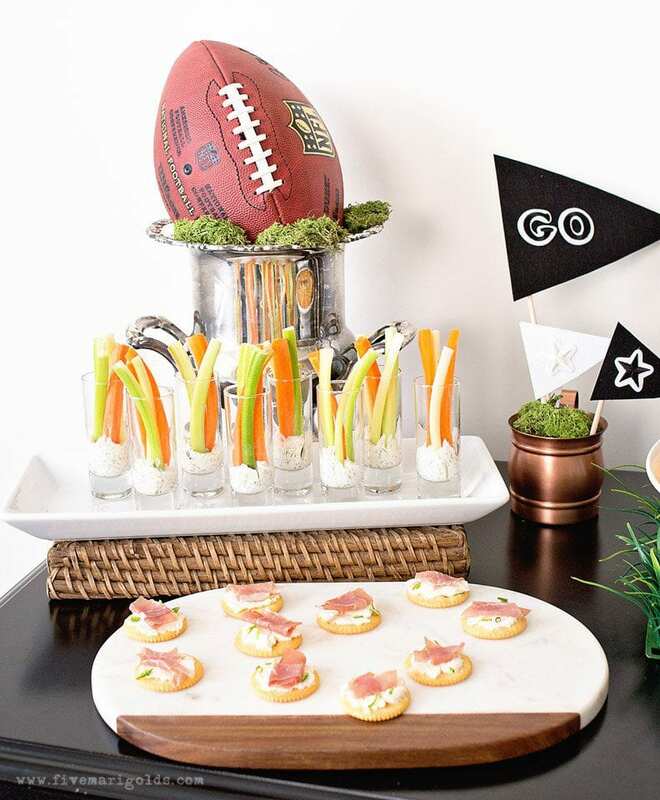 And, I love the way the vase looks like a trophy, with the football and sponge moss topping it. Now for the best part: the food. 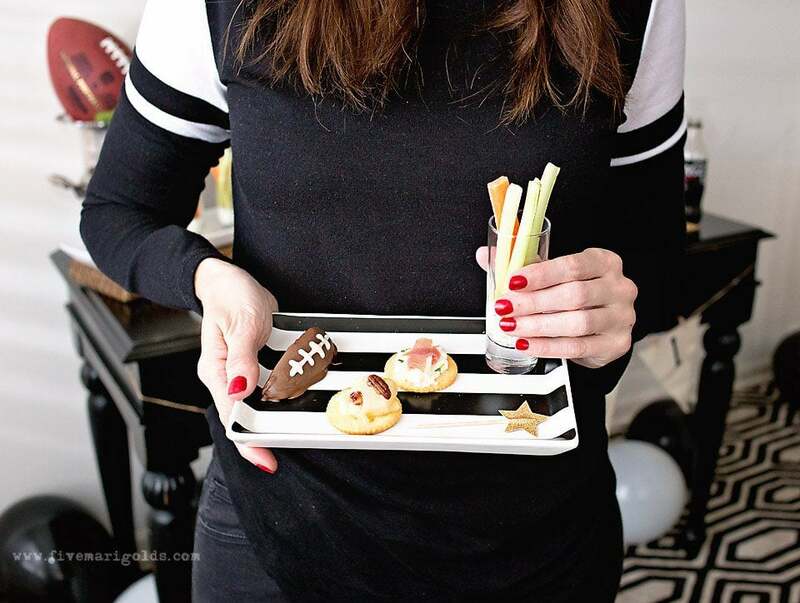 As I mentioned earlier, I’m trying to lighten up my eating, but I wanted to serve special appetizers, desserts, and drinks that would taste indulgent. 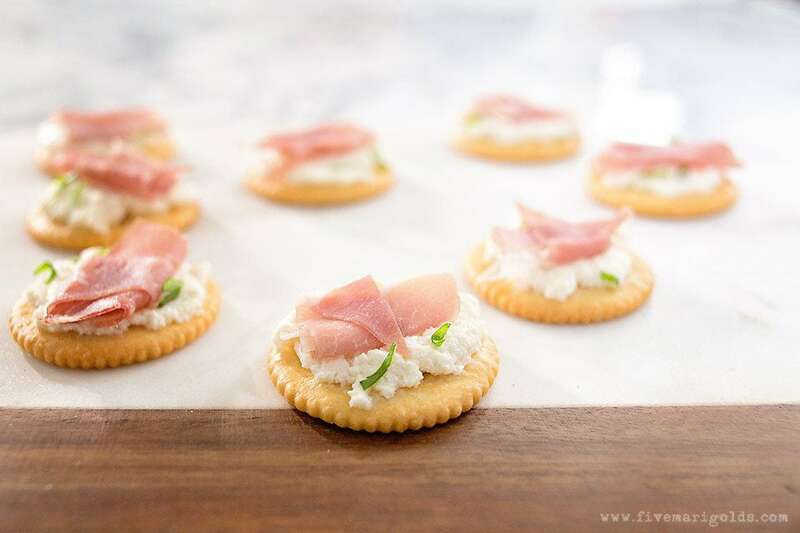 I started with a simple appetizer of RITZ Crackers topped with ricotta cheese, finely chopped green onions, and topped with a triangle shaped slice of prosciutto, rolled up. 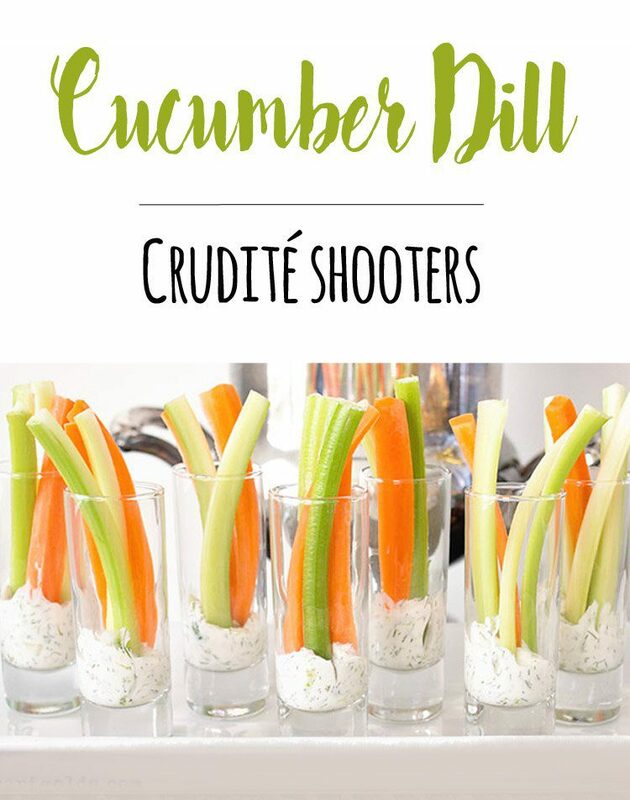 These Crudité Shooters with Cucumber Dill Dip, served in shot glasses, are always a hit. 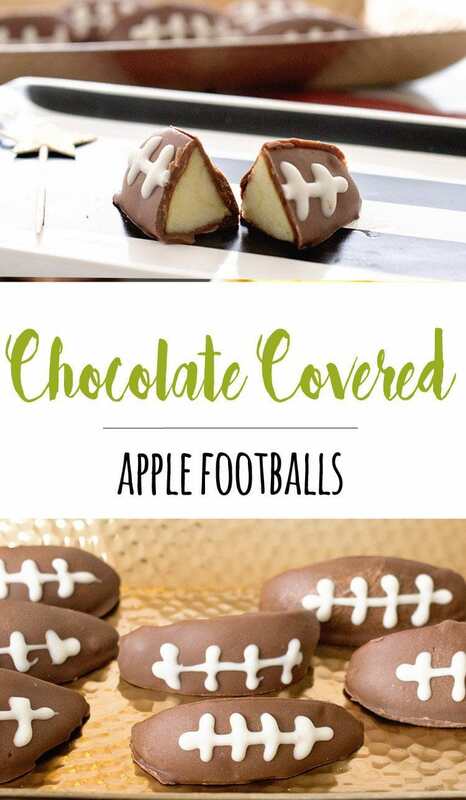 For a sweet treat, I sliced some apples and dipped them in a thin layer of melting chocolate. Then, I poured melted, but slightly cooled, white almond bark in a ziplock bag and trimmed a tiny corner off the bottom to create a makeshift piping bag. I piped white “laces” on the skin side of the apples to resemble little footballs. Cute, right? 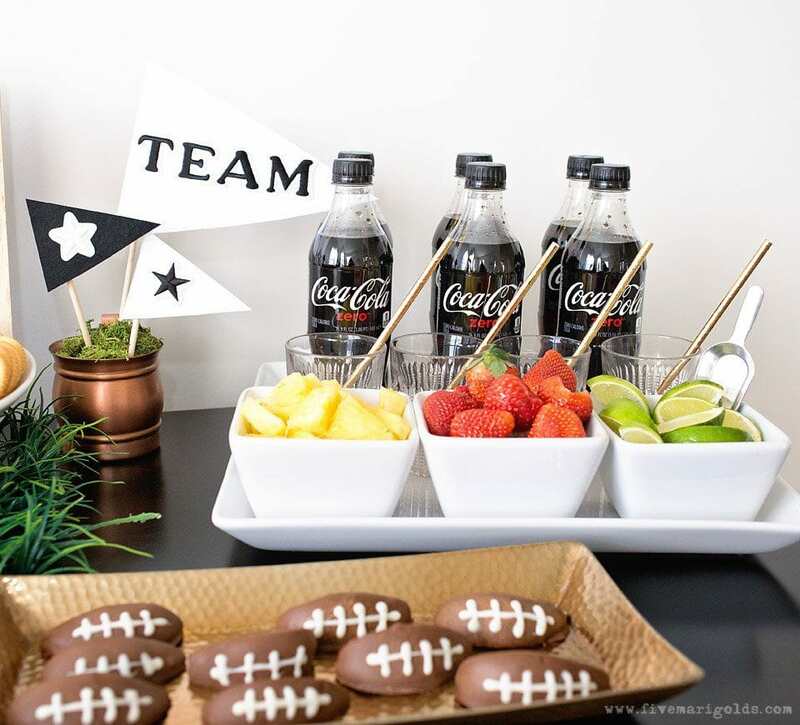 I added a small fruit bar to infuse the Coke Zero we served with custom fruit flavors. You can serve any fruit that’s in season: peaches, strawberries, citrus fruits or pineapple. Seriously, this is so good and refreshing! First, slice the top rind off of the brie. 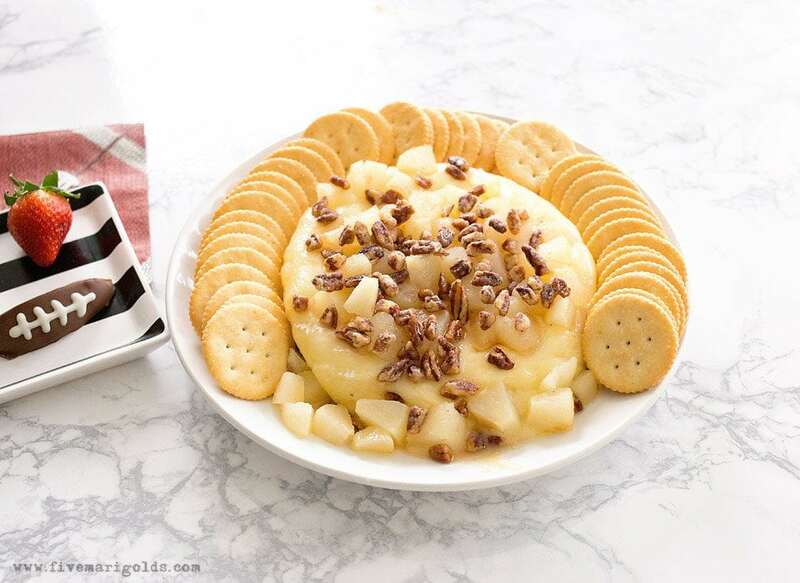 Top it with diced pears, including a little of the juice, and then top with pecan bits, if desired. Bake at 350 degrees for 25-30 minutes, or until the brie begins to melt. Drizzle with honey, before serving. Delish. 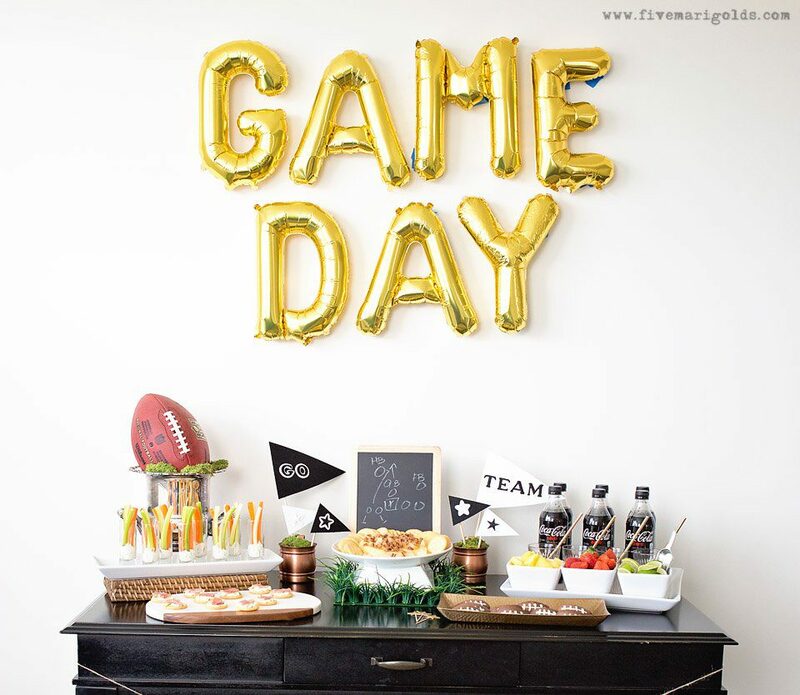 What do you think of my game day party ideas? 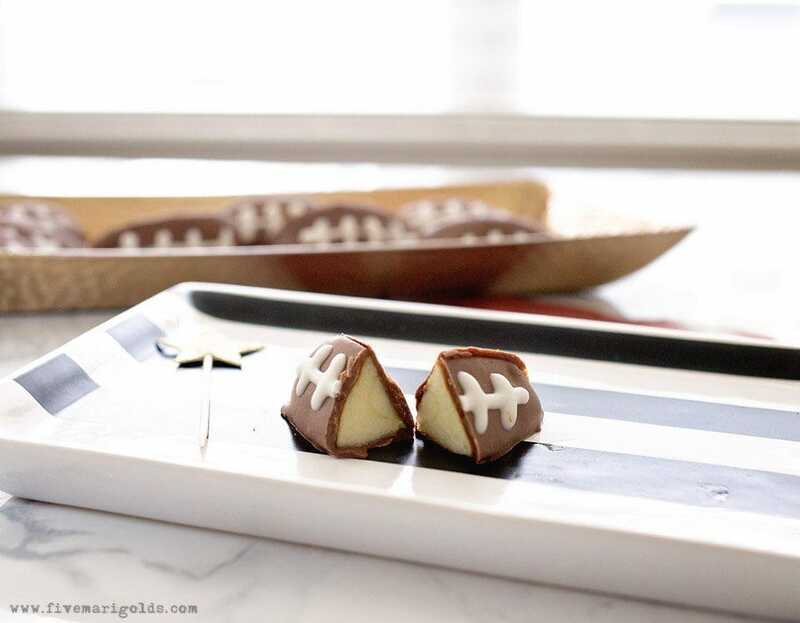 If you like my tips for throwing the ultimate game day party, you’ll love the recipes and entertaining inspiration found here. 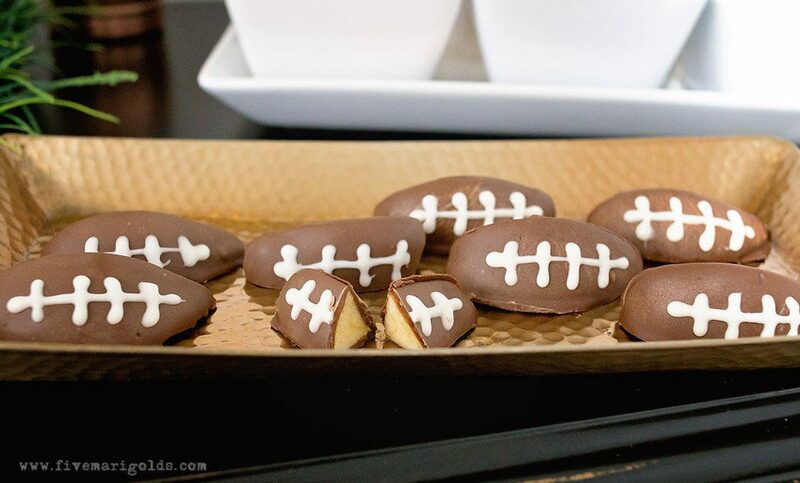 Then, head to Walmart to find everything you need to prepare these game day goodies! Slice off the very top rind of the Brie and discard. 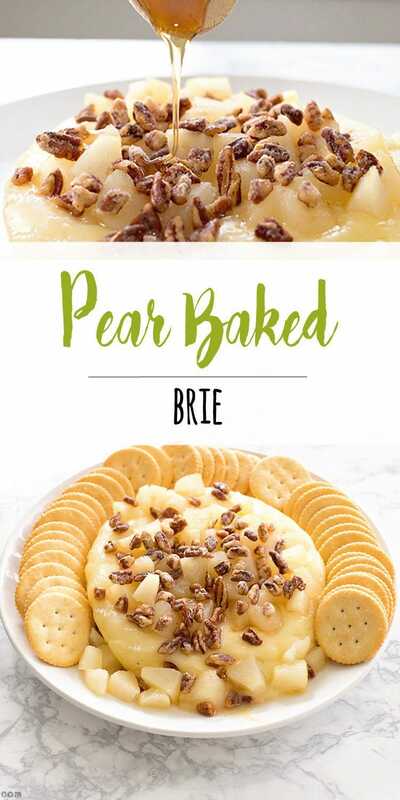 Place Brie on parchment lined oven-proof cookie pan or baking dish, face up. Dice around 1 C. of pears and scatter over top of Brie. 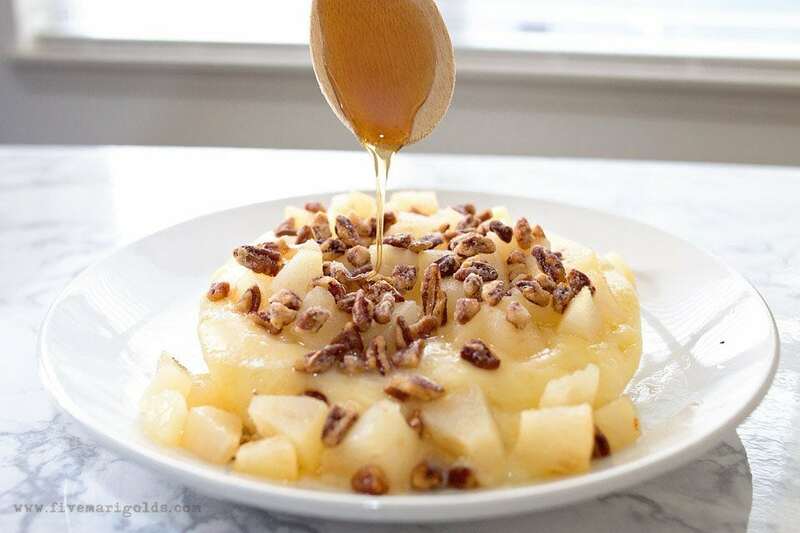 Sprinkle cinnamon and nuts over top of pears. Bake in oven for 25-30 minutes or until Brie is begins to melt. Remove and drizzle with honey. 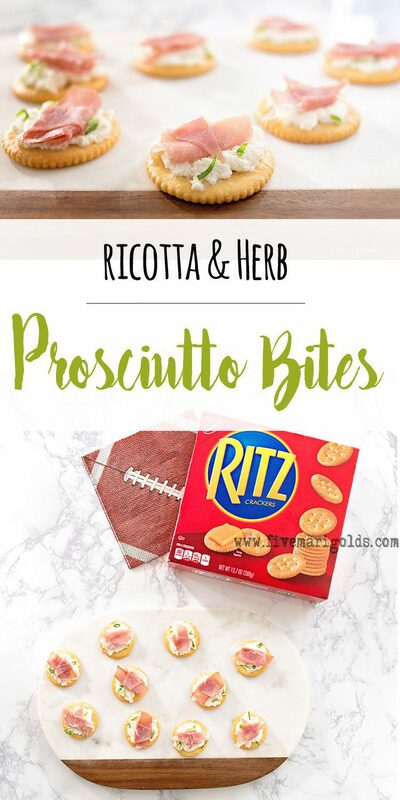 Serve with RITZ Crackers. 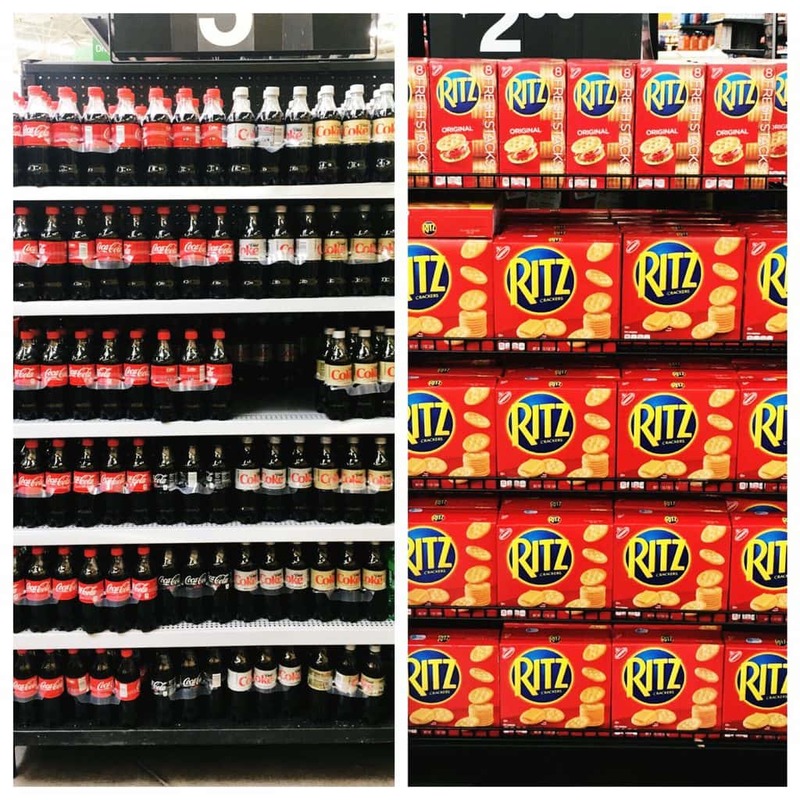 This is such a cute set up, girl! I love the balloons. 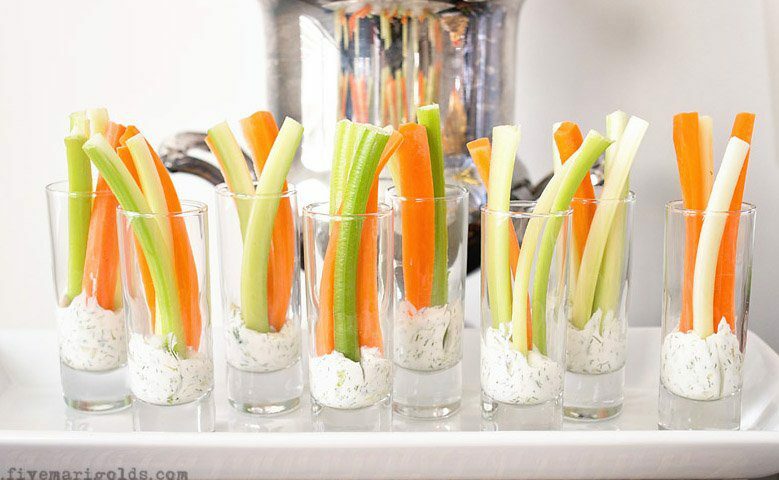 Great looking finger food and the presentation is over the top fun. I love this party so much!! It’s gorgeous but everything is so attainable! Great tips and delicious recipes, yumm! OMG such fun ideas! 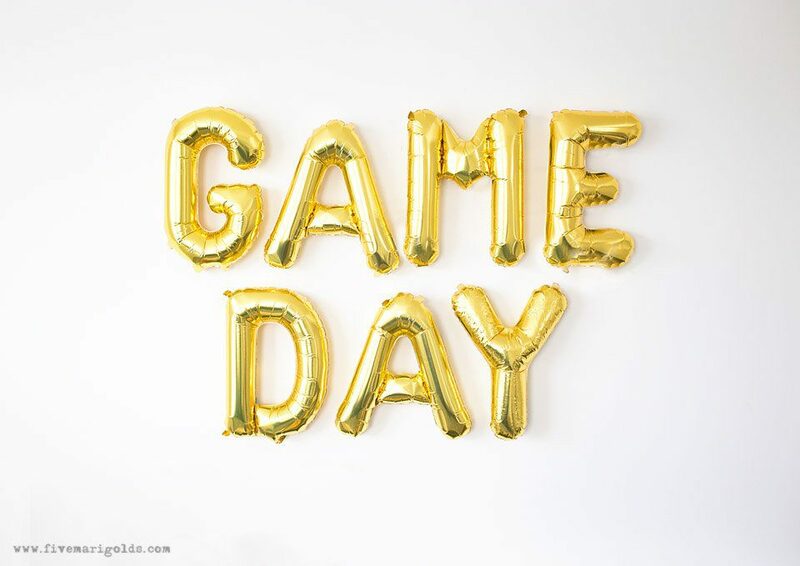 I absolutely love the gold foil letters for almost any occasion. So many great ideas. The food is fantastic. Your decorating ideas are simple, but impressive.